Even better - they were joined by two youngsters. Red-headed Woodpecker is a rare breeding species in Cape May County with just a handful of pairs known to be around, so this was a nice find. To complete the set, here's the other youngster. Can't see him over there on the right? OK, here he is!! Note that young Red-headed Woodpeckers have gray heads. I'll be hoping to see these guys heading south through Higbee's Beach in a month's time. As well as checking on local breeding birds, late July can be a good time for the Platanthera orchids. This is a group of often very showy species, most of which are in serious decline due to loss of habitat and probably a number of other factors. For this reason, locations of plants are usually not revealed, but they can be found if you look for them. However, if you are out looking for such rare plants, please do remember that non-flowering individuals are easily missed and great care should be taken not to trample vegetation. Perhaps the commonest but least showy of our local Platantheras is the Small Green Wood Orchid (P. clavellata) which is fairly widespread in wet woods but easily overlooked in the shadows. Also common and far more showy is the White Fringed Orchid (P. blephariglottis), a big, chunky species that is hard to miss. It's widespread in boggy clearings and not too hard to find. More spectacular yet are the brilliant orange spikes of Crested Fringed Orchid (P. cristata); this is much rarer and not at all easy to find now, but one or two sites still hold reasonable numbers of plants. Rarer still than Crested Fringed Orchid is the truly spectacular Yellow Fringed Orchid (P. ciliaris). This species seems always to have been scarce in the area, making it very vulnerable to habitat changes, particularly in changes in the water table. The two orange species are very similar, but Yellow Fringed (here) has much longer nectar spurs at the back of each flower; those on Crested Fringed Orchid are shorter than the individual flower stem. Close-up of a Yellow Fringed Orchid flower. The presence of Luer's Fringed Orchid (P. x lueri) is another potential threat to Yellow Fringed Orchids. This is actually a hybrid between Yellow Fringed and White Fringed Orchids, as can perhaps be deduced by its pale yellow flowers with white trim. It is possible that subtle habitat changes are allowing the more common White Fringed Orchid to spread and come into contact with the rarer Yellow Fringed Orchid and the two are then cross-pollinated by insects. Many orchid species still appear to be in a high state of flux and hybridization between many species is commonplace, suggesting that species limits are still evolving and not entirely clear yet. The Crack Got Bigger Today! That crack in the dike that I was talking about a couple of days ago just got noticeably bigger this morning! I managed to squeeze out a half-hour of birding this morning before work and there was certainly a great run of birds passing through. The local 'Big Boys' were all down at the state park racking up some nice finds this morning, with an impressive count of nine Sandwich Terns on the beach, a handful of Royal Terns passing by and up to two Gull-billed Terns on Bunker Pond. An American Avocet put in a brief appearance at both The Meadows and Bunker Pond before heading off north-west and a steady trickle of shorebirds continued for much of the early morning session and included at least two Pectoral Sandpipers amongst the more numerous Short-billed Dowitchers, Least and Semipalmated Sandpipers, Sanderlings and Semipalmated Plovers. Amongst the passerines, there was an impressive movement of Tree and Barn Swallows with a scattering of Bank and Northern Rough-winged Swallows too. On Friday evening, Tony Leukering made some great counts at Bunker Pond, which included two Least Terns (they're already shipping out!) 78 Forster's Terns and an excellent 503 Common Terns. Single Pectoral and Stilt Sandpipers were among other shorebirds; water levels are ideal at the point right now for migrant shorebirds - so don't miss out on the show! STOP PRESS - Tony had 814 Common Terns today!! See thousands of Purple Martins each evening as they ready for migration! View this natural phenomenon from platforms next to the Mauricetown Bridge. From 6:15-8:20 p.m., Citizens United representatives will provide viewing scopes and interpretation. Enjoy a Dessert Cruise aboard the "Bodacious". Slowly cruise the river at sunset with local naturalists and representatives from Citizens United to Protect The Maurice River. (approx. 3 hour round trip) RAIN OR SHINE! On 7/21, Higbee’s Beach WMA had LOUISIANA WATERTHRUSH, three BLACK-AND-WHITE WARBLERS, and YELLOW WARBLERS. On 7/22, a rare sight inside the Cape May inlet was a MANX SHEARWATER that was followed around the island and headed towards the point. A EURASIAN COLLARED-DOVE was seen flying down the dunes at Higbee’s Beach WMA on 7/23, with no reports since. Also of note that morning: 3 WORM-EATING WARBLERS, ORCHARD ORIOLES, YELLOW WARBLERS, and a new family of RED-EYED VIREOS that successfully breed there. 16 STILT SANDPIPERS and a BLUE-WINGED TEAL were seen that morning around Cape May Point. An approaching storm brought a lot of change on the afternoon of 7/24; an adult male RUDDY DUCK was found on Lily Lake at Cape May Point along with a sizeable swallow flight- 250 BARN SWALLOWS, 400 TREE SWALLOWS, 220 PURPLE MARTINS, 10 NORTHERN ROUGH-WINGED SWALLOW, and 15 BANK SWALLOWS. Hardly observers stuck it out while the storm passed at the South Cape May beach later that evening and were rewarded with a great shorebird flight: 7 RED KNOTS, 49 WHIMBRELS, 11 SEMIPALMATED PLOVER 6 "WESTERN" WILLETS, 11 RUDDY TURNSTONES, 71 SANDERLINGS, 20 SEMIPALMATED SANDPIPERS, 27 SHORT-BILLED DOWITCHERS and a WILSON’S STORM PETREL. The highlight of the evening was an adult ARCTIC TERN that flew past the Meadows, taking a drink at the plover pond, then continued down the beach to the Cape May Point State Park and ultimately out towards the rips. The same storm up North at Forsythe/Brigantine brought 6 BLACK-BELLIED WHISTLING DUCKS to the Gull Pond tower, and 8 WILSON’S PHALAROPES. The BLACK-BELLIED WHISTLING-DUCKS continue as of 7/27. Forsythe/Brigantine has collected a fine assortment of water birds this week. On 7/22 the WHITE IBIS, and WHITE-FACED IBIS continued from last week along with two newly arrived AMERICAN AVOCETS in the NW pool. Two AVOCETS grew to eight AMEIRCAN AVOCETS in the same pool the next day. They were seen flying South later that afternoon with no other reports. On 7/24 over 50 WHIMBREL and a HUDSONIAN GODWIT were found in the SW pool, and a RED-NECKED PHALAROPE was found in the SE pool. On 7/25, two WHITE IBIS were seen briefly together in the NW pool, shortly after one was seen flying over the North dike out toward Brigantine Island with no reports of two WHITE IBIS since. Also that day in the NW pool: three AMERICAN WIGEONS, six GREEN-WINGED TEALS, a RED KNOT, 13 LONG-BILLED DOWITCHERS, and hour PECTORAL SANDPIPERS. The RUDDY DUCK flock that’s summering along the third dogleg has one less duck to 10 birds. At least one of the WILSONS’S PHALAROPES continued as of 7/26. The same injured AMERICAN GOLDEN-PLOVER found a couple weeks ago was found again in the NW pool the morning of 7/26. On 7/24 two UPLAND SANDPIPERS were found at the Absecon Mill at the corner of Aloe St. and Vienna Ave. in Galloway Twp. The mill is on private property but the birds were viewable from the roadways. Suspected breeders of nearby Atlantic City Airport, other migrant UPLAND SANDPIPERS should be showing up at costal locations any day now. A female CAPE MAY WARBLER was found along Steven’s Street on 7/25. The first juv. RING-BILLED GULL was found on Bunker pond, 7/26. A CERULEAN WARBLER came to a private residence’s mister on 7/26 in Eldora. Migrants noted at Higbee’s Beach WMA the morning of 7/27: AMERICAN REDSTART, OVENBIRD, two NORTHERN PARULAS, two NORTHERN WATERTHRUSHES, two BLACK-AND-WHITE WARBLERS, 13 YELLOW WARBLERS. Migrants engaging in Morning Flight from the dike at Higbee’s Beach WMA on 7/28 include: 3 WORM-EATING WARBLERS, 6 NORTHERN WATERTHRUSHES, 8 YELLOW WARBLERS, and PROTHONOTARY WARBLER. A BLACK TERN was noted at bunker pond of the Cape May Point State Park the morning of 7/28. There's a great big dike somewhere north of Cape May and its job is to hold back all those birds that breed up there, until the time is right. A growing swell and restlessness builds behind it until finally, one day, when the weather and number of birds and so many other things conspire against the dike, the whole lot bursts and we get swamped with avian delights. Well, the past few days has seen a crack in that dike; a little chink in the concrete wall that has allowed a few birds to tumble out and head south. On our Wednesday walk yesterday morning - my chance to sneak out into the field - there was certainly a whiff of migration in the air. A waterthrush of uncertain species flew a couple of circuits high over the state park parking lot before heading back north, little groups of Glossy Ibises, egrets and shorebirds circled the point and steady parties of Red-winged Blackbirds and Brown-headed Cowbirds ran the dune line. I just heard there is a Black Tern currently on Bunker Pond, while highlights for others included 42 Whimbrel passing the point on Sunday, a remarkably early (though not a record-breaker) female Cape May Warbler seen by Tony Leukering along Stevens Street on Monday, a Cerulean Warbler in Brian and Karen Johnson's garden at Eldora and a male Ruddy Duck which turned up on Lake Lily on 17th and still seems to be present. Tony Leukering reported a juvenile Ring-billed Gull at the state park on Wednesday and a Bank Swallow there the same day is the first I have heard of locally this fall. Brigantine has certainly been the place to be with apparently large numbers of shorebirds present, six Black-bellied Whistling-ducks on Sunday and various reports of a White-faced Ibis and two White Ibis over the past week or so. 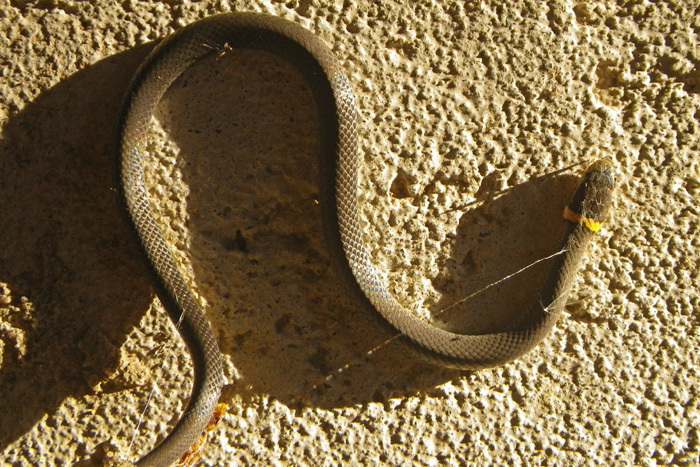 I found this Ringneck Snake (Diadophis punctatus) yesterday morning in our garage, caught up in a particularly sticky spider's web. This species is often split into Northern and Southern subspecies, but South Jersey lies in an overlap zone where many individuals are intermediate in appearance. This one seems to be a Northern with a complete neck collar and a poorly-marked belly pattern (which you can't see here). I unravelled the little chap and he pottered off into the leaf litter behind the house. A LONG-BILLED CURLEW was photographed on the Osprey in Jarvis Sound on 7/18. Unfortunately, thorough searches the next day did not turn up the bird. To register for trips aboard the Osprey please call (609) 898-3500. Four SANDWICH TERNS were noted among the 90 ROYAL TERNS at Stone Harbor Point on 7/18. Two SANDWICH TERNS remained the next day, 7/19. Shorebirds are on the steady increase at Stone Harbor Point with “WESTERN” WILLETS, SANDERLINGS, WESTERN SANDPIPERS, SHORT-BILLED DOWITCHERS, SEMIPALMATED PLOVERS and SPOTTED SANDPIPERS reported. ROSEATE TERNS continue to be seen around Cape May Point, the last report of an adult at the Cape May Point State Park resting on the railings of bunker pond on 7/21. 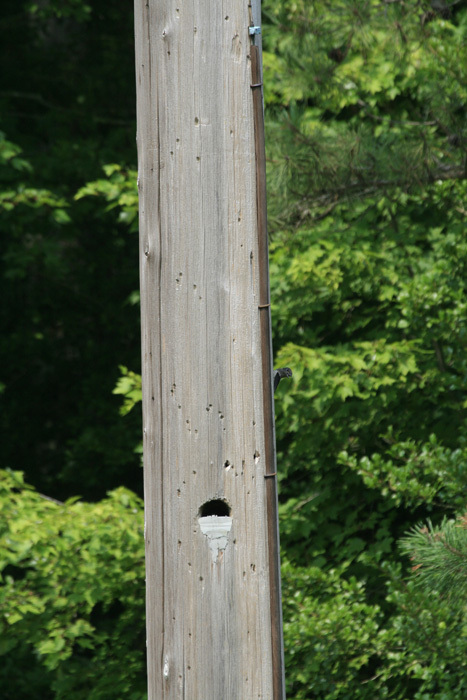 Two RED-HEADED WOODPECKERS were seen at the Route 83 powerline cut by Clermont on 7/16. Forsythe/Brigantine continues to have great birds with WHITE IBIS, WHITE-FACED IBIS, reported this week. A LONG-BILLED DOWITCHER and a juvenile EASTERN PHOEBE were seen at Forsythe/Brigantine on 7/15. With temperatures shooting sky-high here at the moment - with the humidity factored in it reached 116F yesterday I'm told! - it's not surprising that folks are keeping in the shade and bird reports have been a little thin from the point of late. But migration is certainly taking place, as the busy groups of shorebirds attest - so too the occasional Yellow Warbler I'm hearing over my house after dark. It seems that the real spectacle at present is up at Brigantine, where the shorebird spectacle is peaking right now with good numbers of all the regular species being augmented with the likes of a Wilson's Phalarope and no less than eight American Avocets. In addition, it has been possible to see three species of ibis there in recent days, with single White and White-faced Ibises joining the Glossy Ibis gatherings. A never-ending stream of emails, paperwork and any manner of other excuses all seem to be conspiring to keep me out of the field at the moment so do let us know about your sightings if you are birding in the area. Our good friend Beth Polvino continues to enjoy birds at her favorite locations and recently sent me the following collection of photos, all of which sum up those lazy, hazey days at the beach in July. Small numbers of Piping Plovers still hang out at the South Beach, but it's too late now to replace broods lost to Fish Crows; Piping Plovers have not had a good year unfortunately. ..which is something that seems to be infectious! A real close look reveals brown tips to the black feathers on this American Oystercatcher, showing it to be one of this year's youngsters. Lift Off! With the Fish Crows having moved to pastures new of late, the Least Terns are managing to hatch a few eggs and this youngster is now taking its first tentative flaps across the sand. The lack of bird news in Cape May of late has on occasion had me checking that my phone is still working - I almost got to the point of forgetting the hotline number, but luckily such things are pre-programmed these days! And yet, there are migrants out there, as our Wednesday morning walk discovered. Standing in the state park parking lot before the walk, there was a steady trickle of shorebirds moving through; mostly Semipalmated Sandpipers and Short-billed Dowitchers, but also a scattering of others. Bunker Pond gave us a nice selection to enjoy, including both Greater and Lesser Yellowlegs, some very spotty Spotted Sandpipers and two smart adult Stilt Sandpipers. Another group of six Stilt Sandpipers flew in towards the end of our walk making eight overall - a nice count for here. Small groups of Glossy Ibises drifted past us and a snow blanket of Forster's and Common Terns was spread across the pond. Songbirds were in evidence too, with Blue-gray Gnatcatcher and at least three Yellow Warblers present, while a Downy Woodpecker flying down the dunes was surely on the move to somewhere else! But the real proof of bird movement comes when you re-visit a site and things have changed and that happened three times today as I needed to return to the state park for a variety of reasons. On the second visit, the Stilt Sandpiper count had dropped from eight to two but a Roseate Tern had appeared. On the third visit, the tern numbers were at their highest and Common Terns in particular were thick on the ground - they tend to move earlier in the fall than Forster's Terns. If you are looking for a real treat at the moment, I'd strongly recommend going out on a boat trip into the back bays to see the Ospreys, which really are having a great year this year. Bob Lubberman took me out yesterday (on the appropriately-named Osprey! ), along with Tom Reed, in part to check on a possible Long-billed Curlew seen the day before (of which we found no sign), but also so that I could get a feel for what people are seeing on the boat trips at present. We found a nice scattering of Whimbrel and a good range of all the expected shorebirds for this time of year including some pre-migratory gatherings of Eastern Willets, while the weather made for a fabulous trip. But it was the Ospreys that really stole the show. It seemed that nearly every nest had three youngsters, while nearly every available spot had a nest! At one point I did a quick 360 and counted 19 occupied nests - from a single spot! Even an old, tumble-down hunter's lodge had been reclaimed by the birds, with an Osprey nest sat proudly on the roof. Whilst I snapped away with the old Canon camera as usual, I thought I would accompany this post with some photos from Jane Ellison which caught the magic of it all out there. This is the Cape May Birding Hotline, a service of New Jersey Audubon Society's Cape May Bird Observatory. This week's message was prepared on Thursday, July 14, 2011. Highlights this week include sightings of SANDWICH TERN, ROSEATE TERN, COMMON TERN, MISSISSIPPI KITE, BLACK-AND-WHITE WARBLER, NORTHERN PARULA, LEAST FLYCATCHER, YELLOW WARBLER, BLUE-GRAY GNATCATCHER, GLOSSY IBIS, RUBY-THROATED HUMMINGBIRD, BOBOLINK, CASPIAN TERN, STILT SANDPIPER, BALTIMORE ORIOLE, SALTMARSH SPARROW, NORTHERN HARRIER, GULL-BILLED TERN, WHIMBREL, HUDSONIAN GODWIT, WHITE-FACED IBIS, LARK SPARROW, AMERICAN GOLDEN PLOVER, RUDDY DUCK, YELLOW-CROWNED NIGHT-HERON, BROWN PELICAN, GREATER YELLOWLEGS, LESSER YELLOWLEGS, SHORT-BILLED DOWITCHER, WESTERN SANDPIPER, LEAST SANDPIPER, SEMIPALMATED SANDPIPER, SPOTTED SANDPIPER, and BLACK-BELLIED PLOVER. Two second-summer SANDWICH TERNS and an adult ROSEATE TERN were roosting on the beach at Coral Ave. the morning of 7/9. Another first summer ROSEATE TERN was seen there the same morning. Another adult ROSEATE TERN was resting with COMMON TERNS on the beach at South Cape May the morning of 7/9. All three ROSEATE TERNS were found resting on the railings of Bunker Pond at the Cape May Point State Park later that day. Birders were treated to a MISSISSIPPI KITE soaring over Steven’s Street on 7/9. On 7/10 two MISSISSIPPI KITES were seen from the Cape May Point State Park and the Cape May Meadows dune crossing. Passerine migrants were found at Higbees WMA on 7/9 with a juvenile BLACK-AND-WHITE WARBLER, juvenile NORTHERN PARULA and LEAST FLYCATCHER noted. On 7/10, migrants noted from the Coral Ave dune crossover in Cape May Point included: two YELLOW WARBLERS, a BLUE-GRAY GNATCATCHER, 100+ GLOSSY IBIS, 7 RUBY-THROATED HUMMINGBIRDS and 10 BOBOLINKS. The first big hits of BOBOLINKS were detected on 7/13 when 138 individuals were counted from the Cape May Point State Park. Flocks of around 20 birds passed by comprised of mostly adult males. Other birds noted were CASPIAN TERN, STILT SANDPIPER, and BALTIMORE ORIOLE. Marsh bird surveys detected 37 SALTMARSH SPARROWS, two NORTHERN HARRIERS, 12 BOBOLINKS at Tuckahoe WMA on 7/13. Two GULL-BILLED TERNS, six WHIMBRELS, and seven SALTMARSH SPARROWS were found in the back bay marshes behind Stone Harbor the same day. Moving to Atlantic County, Forsythe NWR/Brig is starting to heat up with HUDSONIAN GODWIT, WHITE-FACED IBIS, LARK SPARROW, AMERICAN GOLDEN-PLOVER, and continuing RUDDY DUCKS. An adult HUDSONIAN GODWIT was discovered in the West Pool, on the north dike, about halfway between the dog-leg and the end of the marsh in mixed shorebird company on Tuesday, July 12th, 2011. An adult WHITE-FACED IBIS was also found the same day in the West Pool, near the South tower. Both birds continued the next day along the North dike. A LARK SPARROW was photographed near stop # 7 of the wildlife drive on Wednesday, July 13th, 2011. An adult AMERICAN GOLDEN-PLOVER was discovered near the HUDSONIAN GODWIT later on that day. The summering flock of RUDDY DUCKS continues- 11 birds reported all this week. A CMBO-sponsored cruise through the Great Egg Harbor area produced 28 YELLOW-CROWNED NIGHT-HERONS and a BROWN PELICAN on 7/7. Shorebirds continue to increase with reports of WHIMBRELS, GREATER YELLOWLEGS, LESSER YELLOWLEGS, SHORT-BILLED DOWITCHERS, WESTERN SANDPIPERS, LEAST SANDPIPERS, SEMIPALMATED SANDPIPERS, SPOTTED SANDPIPERS, and BLACK-BELLIED PLOVERS sighted this week. White-tailed Deer at Cape May Point State Park [Photos by Mike Crewe]. So did you wait until picture number 3 before you went aaahhhhhh!!! Or did it kick in straight away?! It seemed wherever I went this morning it was a day of nice terns (no nasty turns or wrong turns!!). Our regular Wednesday morning walk at Cape May Point State Park initially provided us with our first fledgling Forster's Terns of the year, sitting on mud hummocks in Bunker Pond. A while later, Chris Vogel informed us that a Sandwich Tern had joined the loafing terns on the wooden jetty at Bunker Pond (always a spot worth checking over the next couple of months) and this duly became the last bird and a fitting finale to a great walk today. After the walk, Steve Weis and I had a quick look at Sunset Beach to check if the Common Loon was still around that had been there yesterday; it wasn't, but a Gull-billed Tern called right over our heads and headed north up the beach. This was shortly followed by a Royal Tern heading south. Not a bad start to the day! Our walk this morning also turned up four Solitary Sandpipers, the first Purple Martin youngsters that I have seen out on the wing this year and fledgling Barn and Northern Rough-winged Swallows. An adult Black-crowned Night Heron was probably a migrant on the wander. I heard a second hand rumor that the Black-bellied Whistling-duck might be in the state park - it's worth a look! Sandwich Tern on the railing at Bunker Pond this morning [photo by Karl Lukens]. A Common Yellowthroat continues to brighten our state park walks on Wednesday mornings [photo by Karl Lukens]. Star find in the butterfly world of late was this Great Spangled Fritillary in Tom Reed's garden at Reeds Beach on July 5th. Those tatty wings seem to tell a tale, this individual has travelled a fair distance... [photo by Tom Reed]. It certainly looks like many people had a great time birding Cape May this holiday weekend and I returned to my desk to a plethora of emails, weighted down with bundles of pictures. I'll have to hold some for another day, but here are some happy memories of the last couple of days. This Black-crowned Night Heron was seen deftly picking out fish from tideline debris by Beth Polvino. Another Beth Polvino special, an Eastern Willet shows off its smart wing pattern. Though annoyingly distant for the photographers, an adult Black Tern was a nice find at Bunker Pond on Sunday. Karl Lukens continues to keep an eye on the Eurasian Collared Dove at Cape May Point - which, judging from this photograph, is pushing on with its molt nicely and looking a little smarter now. A Roseate Tern on the South Beach on Monday morning continues a good year for this species at Cape May. A measure of success - a juvenile Piping Plover at South Cape May Beach. Note the lack of dark in the plumage and the pale fringes to the upperparts [photo by Jane Ellison]. Starting to really look like an American Oystercatcher now - one of three chicks on the South Beach [photo by Jane Ellison]. Saving the atmospheric until last - I like Karl Lukens' shot of a Green Heron against the light; a typical dark shape lurking in the undergrowth (the heron that is, not Karl!). Though I haven't seen it for a few hours, the Black-bellied Whistling-duck was certainly still on Lake Lily first thing this morning. Elsewhere, a rather sad-looking first-summer Common Loon is hanging off Sunset Beach. After a night of locally heavy showers and thunderstorms, Cape May Point is looking just slightly less like a desert than it had been rapidly becoming. The lack of rain here for some weeks has left many areas looking decidedly parched, with the fields at Higbee's Beach in particular really suffering. The Buckwheat sown to provide food for birds in the fall is looking very sorry for itself, but hopefully will recover to produce a bumper crop of bird food. If there's one benefit from a dry summer, it's that the plants often produce copious amounts of fruit to compensate for the fact that they might not make it through - and there is certainly a bumper crop of blackberries and raspberries in the hedgerows at the moment. Dragonflies are being noticed by everyone right now - and for good reason. Around this time each year, individuals that have emerged from ponds in the warmer States to the south, push north to find new feeding grounds and new places to rear the next generation. This is a good strategy which is easy to work out; as temperatures soar in the south, ponds start to dry out and adult dragonflies find they have nowhere to lay eggs. The reduction in available water also affects the amount of prey available to the dragonflies. The solution? Head north, where surface water is more plentiful and the season's mosquito crop has yet to peak! Quite a sight, and I reckon if I walked round the lake and looked harder, there's easily another five or more species to be added. At the point itself, Swamp Darners, Spot-winged Gliders and both Carolina and Black Saddlebags are making up the bulk of the arriving immigrants - and also becoming part of the food chain themselves. For there is something else that demonstrates as good a sense of timing as the movement of dragonflies in response to drying out ponds - the hatching and growth of Purple Martin chicks. Certainly around here, where dragonflies are plentiful, the arrival of Purple Martin chicks and all those extra mouths to feed happens right as the northbound movement of dragonflies starts, providing the birds with a plentiful food supply. One observation that was recently sent me came from Pat Perkins who spotted something she had read about but never seen before - dragonflies laying eggs on car hoods! This may sound a weird thing but is explained by the fact that dragonflies (along with many other animals) sometimes mistake shiny metal surfaces for water. These dragonfly eggs were inadvertently laid on a car hood in Cape May Point State Park [photo by Pat Perkins]. Dragonflies are attracting a wider and wider audience; they are colorful, easily-observed and lead interesting lives, making them ideal subjects for closer study or just for sheer enjoyment. If you want to know more, consider joining our dragonfly workshop on July 14th - it's going to be a great day out! Check out the details here or call us for more information. (Pre-registration is required). Variable Dancer - common in wetlands throughout the county. Four-spotted Pennant - rare in New Jersey and largely confined to a few locations around Cape May Point. Widow Skimmer - a real eyecatcher! Bar-winged Skimmer - localized but fairly widespread. Twelve-spotted Skimmer - the harlequin of the dragonfly world! Halloween Pennant - common throughout Cape May County. Needham's Skimmer - a real dazzler in many of our wetlands. Calico Pennant - commonly found in grassy meadows away from water.